How does a biographer say something new and insightful about well-known public figures who have already had large dollops of ink spilled on their behalf? 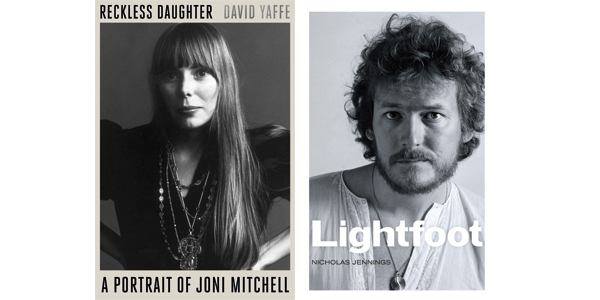 Authors David Yaffe and Nicholas Jennings take distinctly different approaches to that task in their new biographies about groundbreaking Canadian singer-songwriters Joni Mitchell and Gordon Lightfoot. Adding to the challenge of finding something new to say is the fact that both musicians have become reclusive in the late stages of their respective lives (Mitchell is 73, Lightfoot 78). Both have always tried to keep their personal lives private. Helpfully, both authors were given a decent amount of access to their subjects: Yaffe interviewed Mitchell half a dozen times between 2007 and 2017, and Jennings is able to draw from multiple interviews with Lightfoot, done primarily in 2014 and 2016. Interviews were also conducted with major and minor figures peripheral to the books' main subjects. In Reckless Daughter, we hear from many of the musicians who played on Mitchell's albums, as well as Joan Baez, Leonard Cohen, David Crosby, and ex-husbands Chuck Mitchell and Larry Klein. In Lightfoot, Canadian folk and country musicians Murray McLauchlan, Brian and Bruce Good, Ian and Sylvia Tyson, and Ronnie Hawkins weigh in with anecdotes and observations, as do music industry players like Alexander Mair. So what do we end up with? In the case of Lightfoot, a compactly delivered, chronological blow-by-blow of what seems like every step in the musician's career and personal life. It's a dull read, especially if you're looking for insight into what makes the man tick. Lightfoot largely comes across as a fantastically talented figure unafraid to work hard but also tormented by internal pressures, guilt, chauvinism, perfectionism, and, with time, alcoholism. More interesting is Reckless Daughter, which unfolds the story of the complex human being that is Joni Mitchell - or, at least, one version of it. In interviews with Yaffe, Mitchell comes off as bitter and arrogant, funny and intelligent, tough and hardened, but also fun-loving. Sometimes her quotes are uncomfortable (she believes she has "an inner black person"), and her feelings about other people are almost always harsher than the feelings they seem to have about her (Klein is a prime example). Yaffe doesn't directly connect her surliness to the relentless misogyny and industry ruthlessness Mitchell details, though there's little question that those things have contributed to her current prickliness, as have long-running health problems caused by smoking and childhood polio. Mitchell was and is a strong-willed woman who knew what she wanted and demanded it at a time and in an industry where such an approach was not always welcome. Yaffe suggests that the loneliness and vulnerability so alive in Mitchell's music is associated with her giving up a baby for adoption in her early 20s in order to pursue her career. He returns to this more often than necessary, though the idea likely has at least some validity. He also pedantically weaves in a "trying to get back to the garden" motif, lifting the line from Mitchell's 1970 hit, "Woodstock." By contrast, when Jennings links a childhood accident on a pond of thin ice to Lightfoot's tendency toward loss and melancholy in his music, it feels like a stretch. Whereas Jennings takes a straightforward approach to telling Lightfoot's story, Yaffe shapes his narrative around each of Mitchell's albums, sometimes jumping ahead and then circling back in a way that mostly works. He also takes an almost obsessive interest in musical minutiae, quizzing his subject (and her former bandmates) extensively about her chord voicings, arrangement choices, lyrics, and production approaches. Female musicians' skill in technical areas is often overlooked, so this focus is appreciated and serves to illuminate Mitchell's genius as a songwriter, performer, and - notably - producer. Romantic relationships get lots of space in both books. Jennings presents Lightfoot's dalliances in the same perfunctory way he does everything else, whereas Yaffe lingers longer, letting Mitchell's partners become more three-dimensional and using the dynamic as context that sheds light on her songs and person. These books offer a comparison of two musicians who share a common trajectory: coming of age in the 1960s Canadian folk scene, finding success in North America in the '70s, growing discombobulated in the synthetic '80s, attempting to regroup in the '90s, and returning with varying degrees of success in the new millennium. There are mansions, sailboats, temper tantrums, drugs, egos, and divorces. If nothing else, readers will be struck by the vast ways in which the music industry today - for better or for worse - is nothing like what it used to be. This article has been viewed 1,433 times since being added on November 6, 2017.